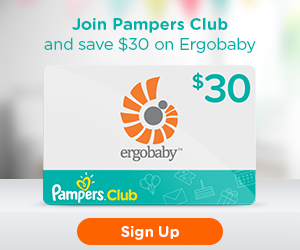 Join Pampers Rewards program to score a FREE $30 Ergobaby Gift Card from Pampers Club. With Pampers Rewards program you can turn diapers into rewards and savings. Save money with exclusive coupons and receive a weekly, customized email, tailored to each stage of your pregnancy or your baby’s development. New users will receive $30 OFF promo code after sign up to be used on purchase of $60 or more!